The South African wilderness radiates romance and is undoubtedly one of the most magical places to visit as a couple. Avoiding the madding crowd is becoming more and more tricky. Remote destinations that were previously unknown are now a hub of tourist activity, and truly intimate escapes are few and far between. Travelling into the bush, however, is one sure-fire way to avoid the crowds and experience intimacy at its best. Located in some of the most scenic and untouched areas in South Africa, safari lodges are always a good option for a romantic getaway. Rhino Sands Safari Camp is a luxury tented lodge situated within the Manyoni Private Game Reserve in KwaZulu Natal. With just four en-suite tents each hidden in their own private section of the riverine forest, guests at Rhino Sands are guaranteed an intimate experience every time. 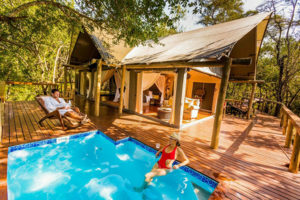 Each of the individual tented suites provides the perfect haven for a couple and has its own private plunge pool, outdoor shower, viewing deck, indoor bathroom and lounge area. The reserve is home to the Big Five and other iconic animals such as cheetah and wild dogs, Rhino Sands offers world-class wildlife viewing opportunities that can be enjoyed on two daily game drives guided by some of the best field guides in the business. In addition to the brilliant wildlife opportunities, Rhino Sands also caters to all your romantic desires and can arrange for just about anything that your heart desires. Find out more about Rhino Sands Safari Camp here. Situated in the same reserve as Rhino Sands, Rhino River Lodge is a slightly more ‘budget friendly’ option that still provides a wonderfully whimsical safari experience for couples. It offers traditional safari accommodation that varies from double story log cabins to luxury en-suite rooms, and two bush homes with their own private pool – the Cottage and the Homestead. Rhino River Lodge is also an excellent destination for a bush wedding. Find out more about Rhino River Lodge here. For something a little different from the traditional safari experience, Ant’s Hill Bush Home is the place to go…especially if you love horses. Situated in a private reserve in the Waterberg region, Ant’s specialises in horseback safaris of the highest standard. With a variety of excellently trained horses, Ant’s prides itself in being able to offer an exciting horseback riding experience to riders of all levels – even if you have never been on a horse before. Unlike other horseback safari destinations, this reserve doesn’t have any elephants or lions so it’s much safer for novice riders. At Ant’s, there are a few different accommodation options that guests can choose from. However, for couples, we recommend the Hideaway and Lookout. Both are deluxe cottages that are simply ideal for honeymooners or couples wanting privacy. Ant’s is also a great place for a destination wedding as there is plenty of accommodation on offer, as well as a local church. Perhaps one of the most romantic safari destinations in South Africa is Garonga Safari Camp in the Makalali Private Nature Reserve west of the Kruger National Park. With just 6 luxury tents, each with private decks and stunning views overlooking a dry riverbed, this tented camp is perfect for couples who enjoy the experience of being part of the bush. In addition to the twice-daily guided game drives, Garonga also offers romantic activities that can be enjoyed by lovebirds. These include two outdoor baths – a bush bath and a star bath (both are big enough for two! ), as well as a sleep out deck where guests can enjoy dinner under the stars and spend the night alone in the bush. It’s all a part of the dreamy Garonga experience. Find out more about Garonga Safari Camp here. 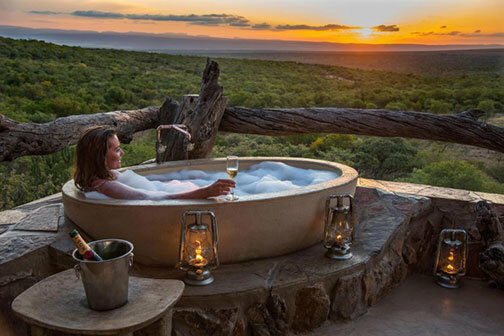 So, if romance is what you’re looking for, you’d be hard-pressed to find a better place to experience it than a safari lodge. After all, nothing makes you cuddle closer than knowing there are lions and leopards lurking outside.